We’re at Fish and Liquor for an al fresco fish and chip lunch on a hot and sunny week day afternoon. Located under the arches just east of the big wheel on Madeira Drive, the restaurant was rejuvenated in January by Brighton businessman David Roberts. 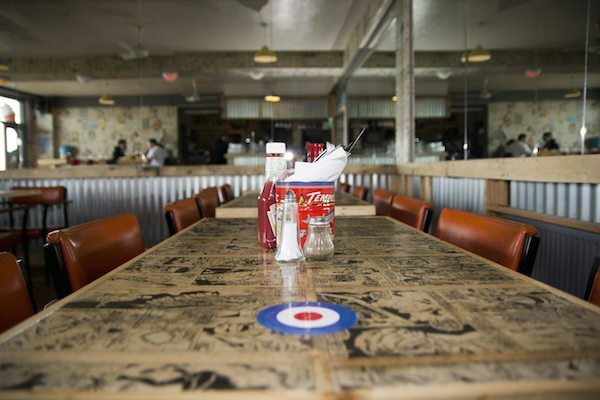 Inside, comic book themed tabletops offer some light-hearted seaside fun, while 1960’s chairs (originally from Hove town hall) and parquet flooring prescribe a mid century aesthetic. Right of the main entrance there’s a counter to order takeaway food from as well. 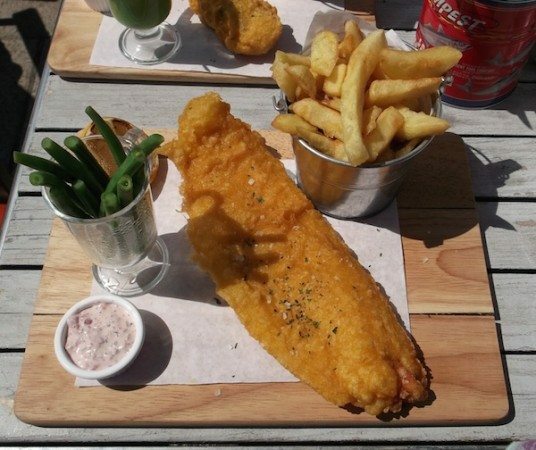 Using locally sourced ingredients wherever possible, Fish and Liquor’s prime offering is high quality traditional fish and chips. Fresh cod, haddock or plaice are each available served with ‘chippy’ chips. In keeping with tradition there are of course pies, battered sausage, mushy peas, the steadfast saveloy and more. More progressive inclusions to the menu are cod goujons with lime, wasabi and sriracha sauces, chicken breast with chorizo in a brioche bun and beef patty served with king prawn. There is of course some liquor to consider too, with wines, beers on draught and by the bottle as well as an extensive range of spirits and cocktails. Today we’ve simply opted for a couple of ice cold Peroni’s. Marking themselves out from the crowd (and for good reason), the fish is line caught locally and always fresh, not cooked from frozen. The potatoes are from a grower in Horsham and meat is purchased from one of the oldest quality butchers operating just along the coast in Woodingdean. To gain the measure of the place we’ve opted for some of the menus traditional penchants. I’ve ordered the battered sausage and chips with mushy peas, my friend has chosen haddock and chips with tartare sauce and a side of green beans. So do the local ingredients deliver? 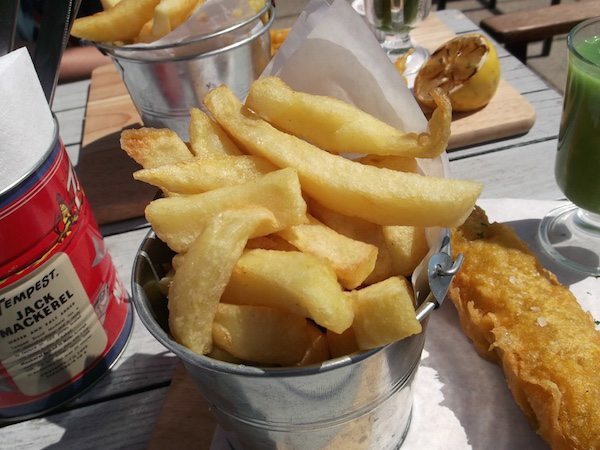 The chips, as one would hope for, are indeed true ‘chippy’ style chips. They’ve taken on a nice golden hue and have been fried to a crisp dry finish. It’s hard to equate if a locally sourced spud, now in chip form, would clearly taste better than a non-local impostor, but they really deliver all that they should and you know they haven’t travelled the country to get here. That’s a good thing. It’s a different story with the Haddock, which patently tastes super fresh and smells subtly of the sea. The flesh is soft and falls apart easily, while the batter is light, well seasoned and trim. Without doubt this fillet is clearly a cut above the norm. The accompanying tartare sauce houses a well judged piquancy, pairing with the fish splendidly. On the side, a pot of green beans have been cooked respectfully, retaining some bite, offering an earthy addition to the plate. Not for the first time I’ve got a battered sausage. There’s always the potential for these kinds of items to unfurl into unmitigated disasters and while they’ll never win any prizes for elegance, this one’s a well-executed specimen. The actual sausage has substance and texture; the batter, like the fish before, is spot on. It is notably devoid of grease too. Mushy peas, pallid green with a watery edge are nowhere to be seen; they are a richer shade, carrying ample weight and tasting good I might add. Along with a pot of brown sauce, there’s some American style mustard too, which in a similar vein to the tartare sauce works a treat. 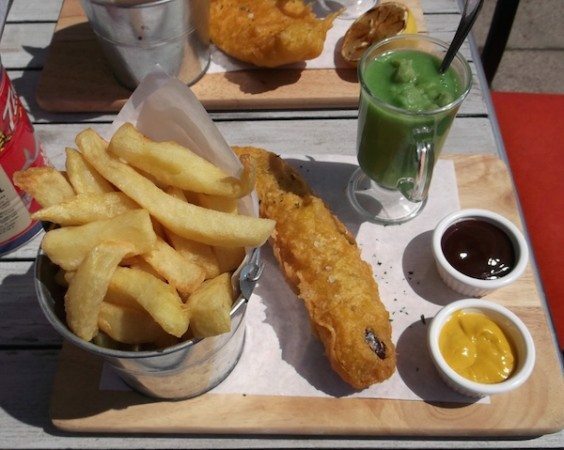 Fish and chips by the sea…by no means a new proposition, sometimes maligned but most definitely part of our coastal fabric like sticks of rock, saucy postcards and jaunts along the pier. Fish and Liquor traverse these traditional footprints while harnessing a modern initiative that’s refreshing and fun. Be it a takeaway to stroll along the prom with or a sit down meal with drinks they’ve unquestionably raised the bar amongst their contemporaries.